Jim is a professional sleight-of-hand magician based in Edinburgh, Scotland. He specializes in performing at Corporate Events and Weddings. Jim is a professional sleight-of-hand magician based in Edinburgh, Scotland. 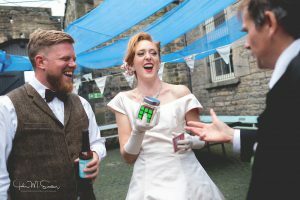 Jim provides a mixture of interactive energising close-up magic with cards, a ring, rubix cube, KitKats and some mind-reading. He is well known for making various objects disappear and reappear in impossible locations, check out the video page on this website. He specializes in performing at Corporate Events and Weddings. Although, he also performs at Christmas Parties, Private Parties, Dinners, Restaurants, Bars, Stag/Hen Parties and Festivals across Scotland and beyond. From the many Google Reviews, it’s clear Jim’s magic will amaze and astound you and your guests. The closer you are the more amazing it is! – Royal Bank of Scotland. – National Museum of Scotland. Jim is resident close-up magician at the world famous Pleasance Courtyard at the Edinburgh Festival Fringe. 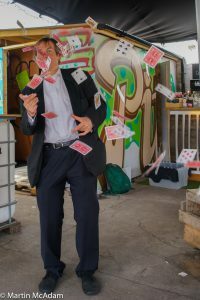 He is also resident magician at The Pitt Street Market (Edinburgh) and Heb Celt Festival (Stornoway). Jim has 23 FIVE STAR Google Reviews, which you can find by doing a google search for ‘Jim the Magician Edinburgh’. With a background in Training and Development, Jim also teaches magic. 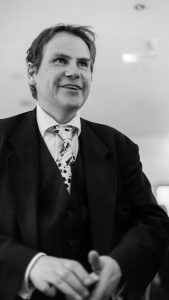 So if you are keen to learn some magic yourself, one of Jim’s magic classes may be just what you need. He can provide one-to-one lessons and group classes. In recent years, Jim has put on a ticketed show at the Pleasance Courtyard in the Edinburgh Festival Fringe. ‘The Magic of Jim’ had sell-out runs in 2015 and 2016. In 2018, Jim was specially commissioned by Edinburgh Art Festival to put on his show ‘Madness: Reality or Illusion’. This which was a cross between a magic show and a lecture exploring what is real and not real in relation to mental health, magic and spirituality. Check out some photos by CLICKING HERE.